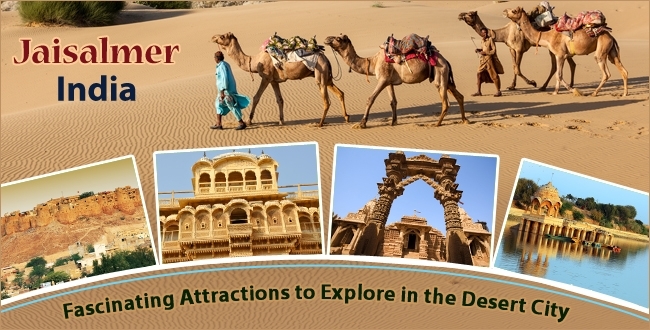 The “Gem City” or the “Golden City” of Rajasthan, Jaisalmer is a popular holiday destination in India. With a beauty that has become the image of Rajasthan Tourism, Jaisalmer holds many surprises, reflecting its exuberant past, culture, nature and its heritage. One of the largest forts in the world, Jaisalmer Fort is the major landmark of the city. Built in 1156AD, the fort is popularly known as Sonar Quila and makes for a mesmerising sight. Unlike other forts of Rajasthan, it is home to a museum, shops, hotels, residential accommodations and restaurants. The fort used to be the centre of many historical encounters between the Mughals of Delhi, the Bhattis and the Rathores of Jodhpur in the earlier times. Surrounded by a 30-feet high wall and featuring more than 99 bastions and some imposing gateways, this place is a must-visit for history as well as architecture lovers. Situated inside the walls of the Jaisalmer Fort, Jain Temples are seven beautiful yellow sandstone structures, drawing attention with their distinctive beauty. Dating back to the 12th and 15th centuries, these temples have a number of mythological figures as well as animals and humans carved in dancing postures in the famous Dilwara style. A large number of pilgrims and architecture lovers are visit here, exploring the divine peace and beauty of the place. Surrounded by numerous artistically carved temples and pavilions, Gadisar Lake is an artificial lake built by Raja Rawal Jaisal, the first ruler of Jaisalmer. This beautiful, historic lake lies towards the south of the city and has its entrance through Tilon-Ki-Pol, an imposing yellow sandstone archway containing an idol of the Hindu deity Vishnu. Whether you wish to spend an ideal picnic day delighting in the beauty of nature, enjoying bird watching and boating or want to discover the rich history, architecture and culture of the city, Gadisar Lake is a perfect place to be. Counted among the most authentic desert dune sites in India, Sam Sand Dunes gives a great start to the exploration of the Thar Desert. Known for its 30-60 feet tall sand dunes, this place is visited by many travellers for thrilling desert safaris on a camel or a jeep. It is located 45 kms west from Jaisalmer city. You can spend a full-filled day here while enjoying thrilling safaris, followed by cultural extravaganza of live music, folk dance, and authentic Rajasthani dinner. An ideal haven for architecture enthusiasts, Patwon-Ki-Haveli is among the most popular havelis in Jaisalmer and is one of the largest in Rajasthan. It is a cluster of five small havelis reflecting an enchanting shade of gold and capturing the attention with its gorgeous jharokhas (balconies), fine wall paintings and stunning archways and gateways. Built by five Jain merchant brothers in the 19th century, these havelis, a long walk through this haveli is bound to reveal many stunning sights.